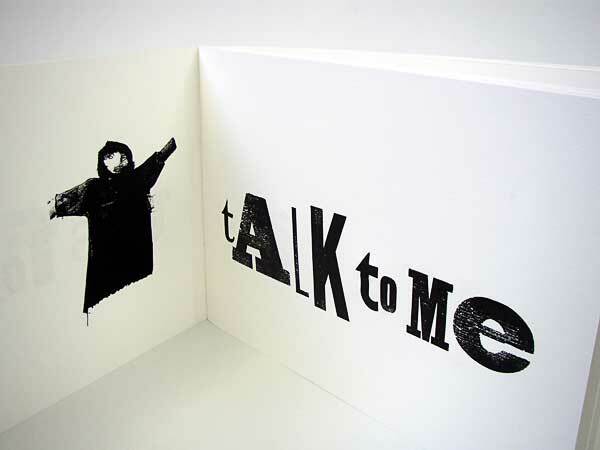 This for Me , 2003; sewn, paper bound; letterpress including handcut wooden type and screenprint on Somerset 300gsm; signed limited edition of twelve; 45 x 32cm, £150, £4 UK/ £8 overseas p&p. 39 x 24cm; £75, £2.50 UK / £5 overseas p&p. 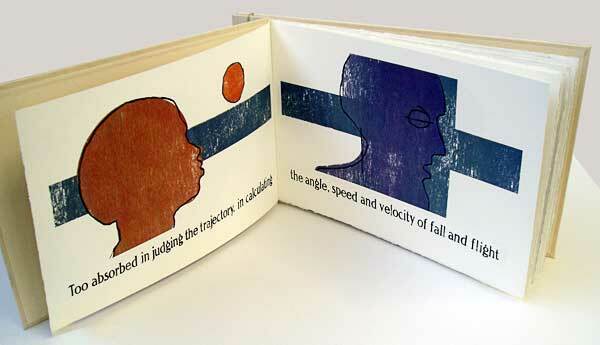 Cush Man , 2004; linen and board covers, flat sheet binding; woodcut, screenprint and letterpress on Somerset 300gsm; signed limited edition of twelve; 52 x 32cm; £300, £4 UK/ £8 overseas p&p. Collection IV , 2005; single sheet cut to concertina fold; screenprint on Somerset 200gsm, signed limited edition of twelve; 10 x 10cm closed; £45, £1.50 UK/ £3 overseas p&p. IX Roman Poems , 2005; loose bound in Canson 250gsm wrapper; letterpress and screenprint on Arches 200gsm; signed limited edition of twelve; 50 x 32cm; £300, £4 UK/ £8 overseas p&p. 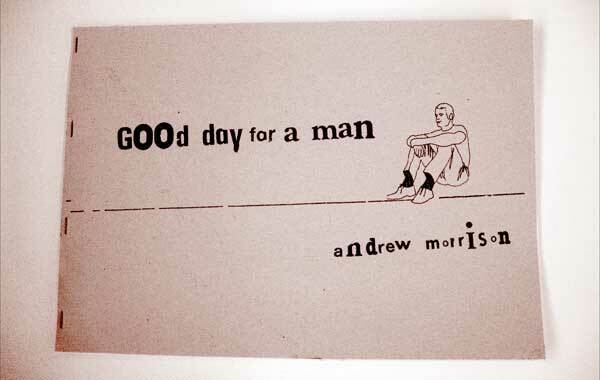 Good Day for a Man , 2004; flat sheet, soft cover, staple bound; photocopied from collage on 100gsm photocopier paper, signed limited edition of fifty; 29.7 x 21cm; £5, £1 UK/ £2 overseas p&p. Medium Weight Words, 2002, fifty cigarette paper leaves in card dispenser box; letterpress on medium weight rizlas; signed limited edition of twenty five; 7.4 x 2.4cm; £25, UK£1/£2 overseas p&p. White Line, 2002, soft bound, single section sewn binding; digital prints of significant white lines on Somerset White 300gsm; signed limited edition of twenty; 20 x 17cm; UK£2/£3.50 overseas p&p. 11 x 8 x 8cm, label size 10 x 4cm; £45, UK£1.50/£3 overseas p&p. Falling Man, concertina bound in board covers; etchings of falling men on Fabriano White 200gsm; signed limited edition of nine; 18 x 12cm; £70, UK£2/£4 overseas p&p. 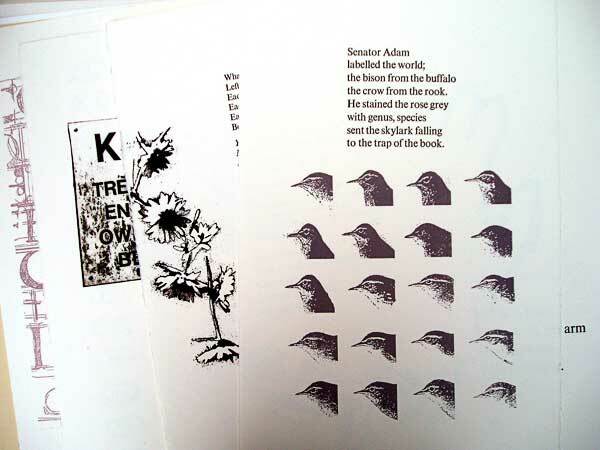 Three, 2003, board covers, Japanese binding; hand burnished woodcuts printed on 30gsm Japanese paper; signed limited edition of six: 64 x 42cm; UK £10/£20 overseas p&p. I have made books for a number of years as part of an ongoing concern with narrative art and with the diverse potentials within image/text combinations. Gradually, books have become my major concern; combining interests in print, typography and narrative poetry and a preference for the intimate and revelatory slow turn of the page over the capacious arena of the gallery. I believe in the artist having control over each element of book production; that the author should also be typesetter and binder. I write short poetic statement, I find texts or discover links between images; the books are vehicles for these simple narratives.